ASE Technology Holding Co., Ltd. (NYSE:ASX) shares haven’t seen a lot of action during the third quarter. Overall, hedge fund sentiment was unchanged. The stock was in 7 hedge funds’ portfolios at the end of December. The level and the change in hedge fund popularity aren’t the only variables you need to analyze to decipher hedge funds’ perspectives. A stock may witness a boost in popularity but it may still be less popular than similarly priced stocks. That’s why at the end of this article we will examine companies such as OGE Energy Corp. (NYSE:OGE), RPM International Inc. (NYSE:RPM), and Nordstrom, Inc. (NYSE:JWN) to gather more data points. At the moment there are dozens of indicators market participants put to use to evaluate publicly traded companies. A duo of the best indicators are hedge fund and insider trading sentiment. Our researchers have shown that, historically, those who follow the best picks of the elite fund managers can outclass the market by a solid amount (see the details here). Let’s analyze the fresh hedge fund action encompassing ASE Technology Holding Co., Ltd. (NYSE:ASX). What have hedge funds been doing with ASE Technology Holding Co., Ltd. (NYSE:ASX)? 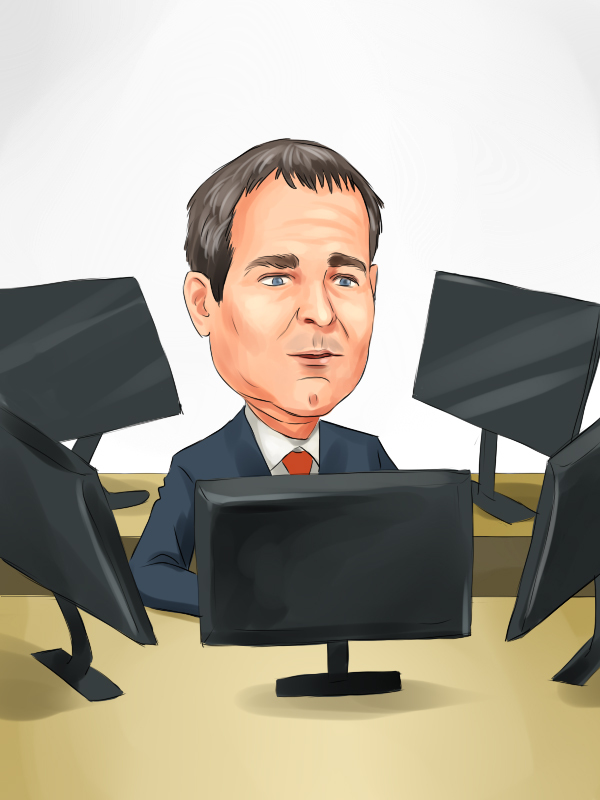 At the end of the fourth quarter, a total of 7 of the hedge funds tracked by Insider Monkey were bullish on this stock, a change of 0% from the second quarter of 2018. 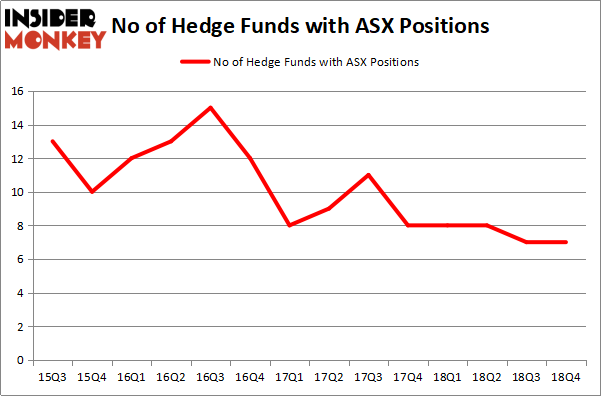 On the other hand, there were a total of 8 hedge funds with a bullish position in ASX a year ago. With hedge funds’ positions undergoing their usual ebb and flow, there exists a few notable hedge fund managers who were upping their holdings considerably (or already accumulated large positions). More specifically, Fisher Asset Management was the largest shareholder of ASE Technology Holding Co., Ltd.(NYSE:ASX), with a stake worth $144.2 million reported as of the end of September. Trailing Fisher Asset Management was LMR Partners, which amassed a stake valued at $24 million. Renaissance Technologies, D E Shaw, and Two Sigma Advisors were also very fond of the stock, giving the stock large weights in their portfolios. We view hedge fund activity in the stock unfavorable, but in this case there was only a single hedge fund selling its entire position: Kadensa Capital. One hedge fund selling its entire position doesn’t always imply a bearish intent. Theoretically a hedge fund may decide to sell a promising position in order to invest the proceeds in a more promising idea. However, we don’t think this is the case in this case because only one of the 800+ hedge funds tracked by Insider Monkey identified as a viable investment and initiated a position in the stock (that fund was Citadel Investment Group). Let’s also examine hedge fund activity in other stocks – not necessarily in the same industry as ASE Technology Holding Co., Ltd. (NYSE:ASX) but similarly valued. These stocks are OGE Energy Corp. (NYSE:OGE), RPM International Inc. (NYSE:RPM), Nordstrom, Inc. (NYSE:JWN), and Qiagen NV (NYSE:QGEN). All of these stocks’ market caps match ASX’s market cap. As you can see these stocks had an average of 20.75 hedge funds with bullish positions and the average amount invested in these stocks was $335 million. That figure was $175 million in ASX’s case. RPM International Inc. (NYSE:RPM) is the most popular stock in this table. On the other hand OGE Energy Corp. (NYSE:OGE) is the least popular one with only 16 bullish hedge fund positions. Compared to these stocks ASE Technology Holding Co., Ltd. (NYSE:ASX) is even less popular than OGE. Considering that hedge funds aren’t fond of this stock in relation to other companies analyzed in this article, it may be a good idea to analyze it in detail and understand why the smart money isn’t behind this stock. This isn’t necessarily bad news. Although it is possible that hedge funds may think the stock is overpriced and view the stock as a short candidate, they may not be very familiar with the bullish thesis. Our calculations showed that top 15 most popular stocks among hedge funds returned 21.3% through April 8th and outperformed the S&P 500 ETF (SPY) by more than 5 percentage points. Hedge funds were also right about betting on ASX as the stock returned 21.3% and outperformed the market as well. You can see the entire list of these shrewd hedge funds here.